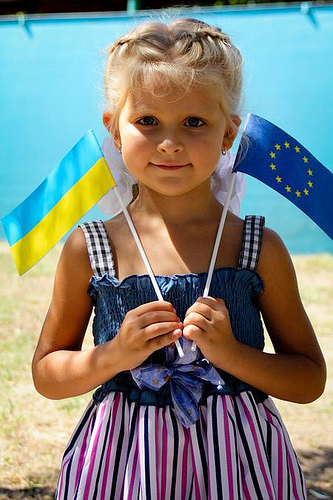 Most Ukrainians feel the European Union is an important partner, and would like it to play an even greater role in their country, across a range of areas. This is one of the key findings of the recently released Autumn 2012 EU Neighbourhood Barometer for Ukraine, conducted in the framework of an EU-funded opinion polling project for the Neighbourhood. The survey, based on 1,000 interviews conducted in November-December 2012, finds that 60% of Ukrainians feel the EU is an important partner, with 57% believing the EU and Ukraine share sufficient common values to be able to cooperate – slightly higher than the average for the ENPI East region. Just over three quarters of those asked (76%) wanted a greater EU role in economic development, 69% in trade, 64% in human rights, and 60% in democracy. The poll found that 53% of Ukrainians trusted the EU – more than other international institutions like the UN and NATO, and significantly more than they trust their own government (23%), Parliament (18%) or political parties (18%). Forty-one per cent of respondents felt the EU had good relations with Ukraine, while 30% felt they were bad. Ukrainians questioned in the poll were generally pessimistic about their lives – more so than other countries in the region – with 57% dissatisfied with the life they lead, though the degree of satisfaction rose the younger and more educated respondents were. However, the younger and more educated were just as critical as other groups regarding the direction in which the country was going: barely one in ten (11%) of all those asked felt Ukraine was going in the right direction, with 78% saying the economic situation was bad, and 48% saying the worst was still to come in terms of the impact of the crisis on jobs. Three quarters of those asked were not satisfied with the way democracy works in Ukraine. Forty per cent of those asked agreed enough information was available about the EU, while 41% agreed it was easy to understand (against 36% who disagreed). Factsheets summarising the findings of the EU Neighbourhood Barometers were published to coincide with the release last month of the European Neighbourhood Policy (ENP) package of 2012 progress reports of countries covered by the ENP. The EU Neighbourhood Barometer (opinion polling and media monitoring) is part of the EU-funded Regional Communication Programme, and aims at assessing knowledge and perception of the EU Neighbourhood Policy and its cooperation activities and programmes.